While speaking at a historically black college, the Massachusetts senator identified some of the system’s failures: disproportionate arrests of African Americans for petty drug possession; an overloaded public defender system; and state laws that keep convicted felons from voting even after their sentences are complete. 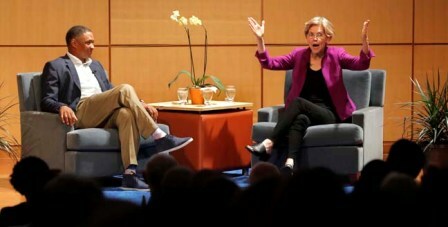 Warren was participating in a Q&A session hosted by Con­gressional Black Caucus Chairman Cedric Richmond at Dillard Uni­versity in New Orleans. She was among several possible Democratic White House contenders who spoke Friday at Netroots Nation, an annual conference for progressives. She was the only leading Democrat to appear at Dillard. The stop is the latest sign of Warren’s effort to forge ties beyond her largely white political base in Massachusetts and avoid the fate of fellow progressive icon Bernie Sanders, who struggled to win over African-Americans during his failed bid for the 2016 Democratic presidential nomination. Warren has previously addres­sed the NAACP and the Rev. Al Sharpton’s annual civil rights gathering. She visited Martin Luther King Jr.’s Atlanta church last year for a program alongside the Rev. Bernice King, the slain civil rights leader’s youngest daughter. Facing re-election to the Senate this year, Warren did not directly address her 2020 plans. But when Richmond asked her what might have changed since she decided not to run in 2016, the senator was ready. “Two words: Donald Trump,” Warren said, before shifting to warn the audience that the November midterm vote is the immediate fight as Democrats try to break GOP control of Congress. Other than on criminal justice, Warren did not focus her answers on race, offering her usual creed about bending public policy back toward working-class Americans. She called for support for unions, massive investments in infrastructure and more spending on education, including programs for preschool-age children and debt relief for student loans. Ahead of the event, Richmond said any aspiring Democratic nominee will have to address black voters directly. Richmond praised Warren’s work as a consumer advocate and her willingness to explain her policies with her personal story, principally her mother’s venture into the workforce to support the family amid her father’s health problems. Warren opened with that narrative at Dillard, and it struck a chord with some who came to hear her. “What really resonates with me was her background, coming from a meager place and using hard work and education to get to where she is today,” said David Hoey, a pastor in Shreveport, Louisiana. C.J. Wiltz, a retired Dillard professor who came to hear Warren, said her work on Capitol Hill stands out. “I was especially interested in what’s she’s been saying about the financial sector and how the impact of big banks on poor people has manifested,” he said, adding that he’d “like to see her run” in 2020. In Massachusetts, less than 10 percent of the electorate is African-American. Running for president, Democrats must navigate a primary calendar front-loaded with Southern states where African-Americans determine the outcome. In 2008, that helped Barack Obama sweep the South and build an early, insurmountable delegate lead over Hillary Clinton. In 2016, Clinton managed the same sweep against Sanders, a Vermont senator whose home base is mostly white. The coming campaign could include several black candidates such as Sens. Kamala Harris of California and Cory Booker of New Jersey, former Attorney General Eric Holder and former Massa­chusetts Gov. Deval Patrick. San­ders could make another bid. And while Obama isn’t on the ballot, his vice president, Joe Biden, could be. “There will be a search for someone they can hear and see and immediately identify with,” Aneesa McMillan, who worked for Sanders' campaign, said of black voters. But, she added, “it’s not impossible” for that to be a white candidate.